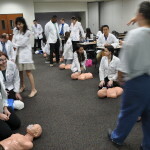 At the beginning of our third year we have a lab on CPR training in the course “Patient Care/ Physical Diagnosis” with Dr. Fortepiani, MD, PhD. 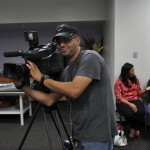 This year the local San Antonio News came to film our CPR class! Kens5‘s segment aired on Tuesday May 2nd, 2014 at 9 am. It was a really exciting lab and I am so glad to have taken this course for the first time. 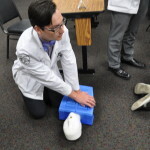 This training course covers more than just CPR, they also taught us the Heimlich Maneuver (for choking) and how to use an automated external defibrillator (AED)! 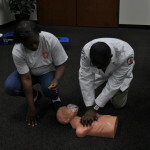 The American Heart Association (AHA) facilitated this 5 hour CPR course. 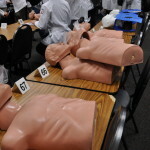 The AHA brought all the supplies needed for this course: the adult CPR mannequins, face shields, infant dummies along with the automated external defibrillators (AED) and the Bag Valve Masks (BVMs). At the end of the course the class has to take a multiple choice test to qualify for the CPR certificate. The process was fun but definitely challenging. 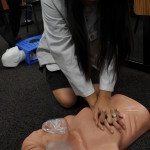 Yes, it was my first exposure to CPR. 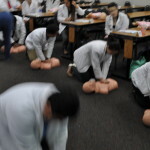 I did not know what was in store, but I definitely left the course feeling confident that I can do CPR and that I should probably work on my arm strength too. As you can guess, compressions were the main event . AHA indicated that compressions, when done as early as possible, is the most effective (please refer to the AHA website for more info). 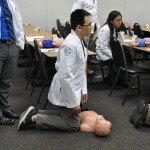 The AHA staff walked around the room making sure that every student performed compressions correctly and asked them to repeat this procedure over and over again. 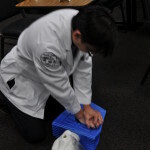 The compression part of CPR is very powerful in that you can perform compressions only and it would be just as effective as compressions + breath. We also chanted CAB! CAB! That was the acronym for Compressions-Airway-Breathing. 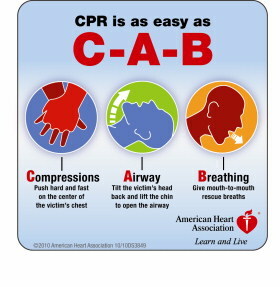 This is the pattern to follow as demonstrated by the CAB graphic by the AHA. 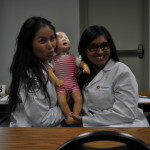 We performed this over and over again on adult and infant mannequins and the staff would help us every step of the way. Although the compression only techniques work well with adults, please be advised that CPR on a child requires breaths! 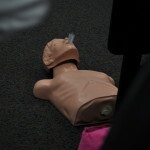 The second part of the CPR course was about other tools that can help someone when they are not breathing! the AHA staff brought an AED and showed us how to use it. 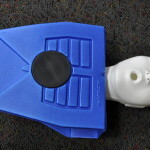 I did not know that almost all public places like Walmart or McDonalds have AEDs! The defibrillator will deliver a shock to the person who is not breathing to jolt/ equilibrate the heart, so we had to make sure to shout “CLEAR!” and make sure no one was touching the unconscious person. AHA also showed us how to perform CPR with two people. 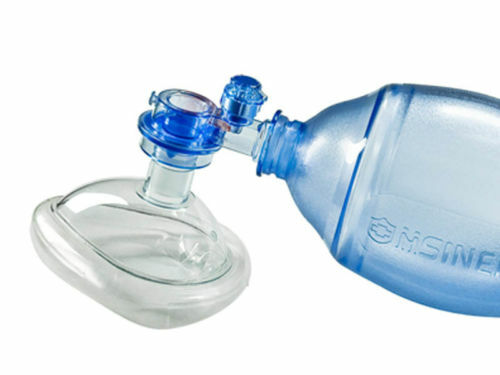 The main difference with 2 people is that you can perform more breaths between compressions and you are open to use bag valve masks (BVMs). These masks will help give breaths instead of you giving mouth-to-mouth. 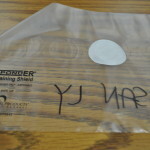 We learned that there are usually adult AED pads and adult BVMs (for post-puberty/adults) and pediatric sized AEDs/BVMs (for ages 1-puberty/8 YO). They are drastically different in size but important for us not to mix up! The last item on the agenda was what to do when you see a person choking or not breathing from choking. The acronym was COB! The main difference between CAB and COB is that after compressions, you should only fish for the obstructing object in the person’s throat if the object is clearly visible and easy to get. We also learned how to perform the Heimlich maneuver, also known as abdominal thrusts on ourselves and on each other. All in all, it was a lot of fun. 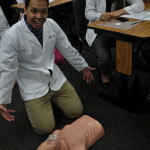 My classmates were smiling the whole time and were really passionate about learning CPR. 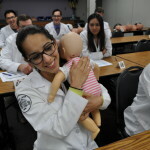 We understand how important this skill is as a future healthcare provider. I’ll be sure to take another course when my certification expires in 2 years! After starting my first semester in third year, I would say that my favorite course is the Advanced Contact Lens course, because my experience with this course is like nothing before! 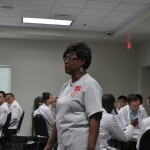 In addition to our regular labs, our faculty, Dr. Mickles and Dr. Collins decided to invite the STAPLE program to help further our education. The Soft Toric and Presbyopic Lens Education (STAPLE) Program is a collaborative effort on behalf of Alcon, Bausch+Lomb, CooperVision and VISTAKON, a Division of Johnson & Johnson Vision Care. These Industry vendors support this program by providing a contact lens specialist speaker and scrumptious meal for the students and participants. 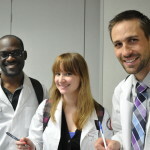 Participants were recruited by the RSO Contact Lens faculty and the RSO Contact Lens Society. Participants who qualified to be patients in our workshop received a gift card for allowing students to fit them with contact lenses. Our guest lecturer for toric lenses was Dr. Rosen from Michigan College of Optometry. He reviewed the basics, i.e. toric lenses correct for astigmatism more accurately due to its shape and hence stability. Dr. Rosen also goes into more detail and I really appreciate the new practice management perspective of having contact lenses. 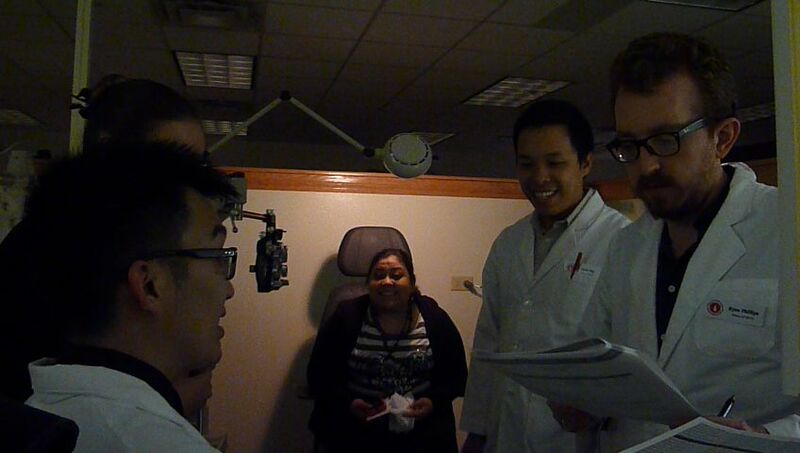 Our second workshop centered on contact lens for presbyopia. I was a bit overwhelmed by the variety in optics and style of presbyopic contact lenses, but because the material from the presentations corresponded so well with our lectures and labs, I was able to learn better. 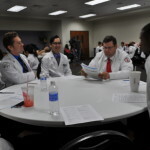 Below is a video that I made during our STAPLE Program Workshop which includes the highlights from Dr. Rosen’s lecture and interview with one of the STAPLE Coordinators, Ursula Lotzkat.